Victoria Warehouse is the up and coming music and events venue in Manchester. It’s very cool, very industrial and pretty unique. The Bays – to get to the bays you walk through the hotel reception, down the corridor passed their very funky decor and arrive in Bay 1 with the large bar that acts as a reception area for the day. Bay 2 is a large open space, with bare brick walls and no natural light. The room works really well with fairy lights, lots and lots of fairy lights. If you want a venue that’s intimate and all about pools of light, this is definitely for you. And for your ceremony, you can choose to either run with the house lights, or switch them off entirely – lighting the space with fairy lights and candles makes it feel very intimate. Top tip: with no natural light available and the abundance of fairy lights, this space can be quite difficult to capture so please come prepared. I may have blown up a speedlight here before (it’s ok, I always carry spares). 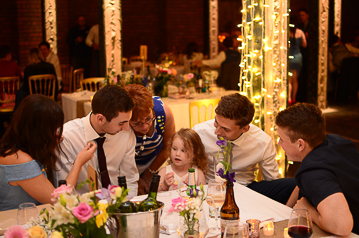 The Cotton Sheds – There are seven “sheds” in total, hosting wedding parties with a range of different sizes. Shed A is vast – if Beyoncé & Jay-Z are on your guest list, this room is just about big enough to house their entourage – the venue quote that this can seat up to 950 guests for a banquet or 5000 guests for gig. There is also a mezzanine on the first floor which is mainly used as a VIP section for gigs etc, this adds a further banqueting space for 320 people and takes the total upto a whopping 1270 people for banqueting. That is one serious space for a wedding. Sheds B to G range in size from banquette seating for 200 to 460 guests. These rooms are very industrial, with exposed concrete support beams and bare brick. These rooms are blank spaces for those with lots of imagination and flair for decoration. Top Tip: Again, there is no natural light in any of these spaces so it is likely that you photographer will be using a combination of flash and video lights to make this manageable. Top Tip: there is very little in the way of greenery here but there are still some epic spots for cool couples portraits, specially if you go for a short walk from the venue. The staff are cool and helpful. It sits in the shadow of Old Trafford and right next to Salford Quays. It is sooo easy to get to it’s untrue! 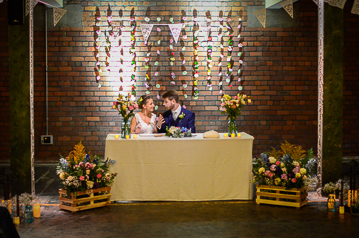 If you are looking for a cool and unique venue, you have definitely found it in Victoria Warehouse. 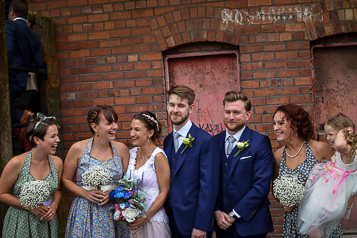 It’s very urban and offers a blank canvas for you to plan your amazing day around. It really suits photographers that like pools of light and that love the opportunity to light spaces creatively.